Risney Photo has been around for over 50 years. My parents, Harry and Kathy Risney, started the business in Missouri Valley, Iowa back in the 1950's and after my dad died in 1978, my mother continued to photograph until her death in 2004. I am their daughter, and I took over the business in February 2005. Because of my vast graphic design background, I added "& Design" to the name to become Risney Photo & Design, Inc.
All my life I have wanted to be a working artist and make a living doing what I love. Photography and graphic design have been my outlet for that creativity. 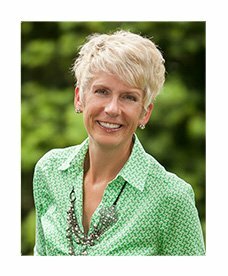 I received my formal training from the University of Nebraska where I hold a Bachelor of Fine Arts Degree, and then went on to hone my artistic skills for 21 years providing graphics, printing, photography and art direction for two Omaha-based companies. I am a member of the Professional Photographers of America and the Professional Photographers of Nebraska and regularly attend seminars and conferences to remain on the cutting edge of photographic services. One of the cool things you will find in working with me is my ability to do interesting things with the photos AFTER they have been taken. It used to be that clients were limited to ordering basic sized prints such as 5x7 or 8x10 sizes for instance. But now in the digital world, a photographer has a much larger arsenal of products to offer clients and with my graphic design background you get the added benefit of having not only a great photographer take your pictures, but also a seasoned designer who is able to use those photos in multi-image collages, gallery style prints and even coffee table books. I am always looking for innovative ways to showcase your portraits so you can have choices in addition to the traditional "on your desk" methods. "Thanks so much for the effort you put into making my son's pictures so great. I knew from the day you took the proofs that you really put a lot into your work and it shows. Believe me, it was hard to exercise restraint and not order every single picture you took since you did such a great job. I will most definitely keep you in mind in the future and I will highly recommend you to friends who have need of your services as well." 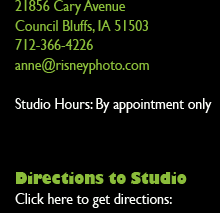 Risney Photo & Design is a home-based photography studio located just south of Council Bluffs, Iowa. Due to my close proximity to the Wabash Trace Nature Trail, I have the opportunity to shoot unique outside photographs that are just a short distance from my front door. Other beautiful outside venues I have used are locations such as Lake Manawa State Park or the grounds of Iowa School for the Deaf. We can also consider a photo shoot in the Old Market of Omaha or at your very own home. For more of a traditional look, I have a variety of backgrounds and props at my garden level studio to choose from. Overall, Risney Photo & Design should be your photographic studio of choice for High School Senior Photography, Family Portrait Photography, Maternity and Children Photography, Sports Teams Photography, and Corporate Head Shots or group events. I am a very talented and friendly photographer with the artistic, technical and graphic expertise to capture and preserve your most precious photographic moments forever.